One day I will be an eater of sandwiches. But for now aside from the odd grilled cheese, I am not a sandwich girl. Just don’t like all the bread, the sliced deli meats, cold salads inside…I just don’t get it. Unless of course it is a pressed Cuban sandwich, con todos los poderes, de Elegguá pa’bajo…you know, like real bread, toasted, mad quantities of stuff, greased up…I can do that. In Miami. Or San Juan de Puerto Rico (ah, Kasalta). Occasionally. But not being a sandwich person in this American life is to miss out on a lot of convenience and portability. So, I have discovered the quesadilla. Take whatever you’ve got in the fridge, spread it over half of a tortilla toasting in a skillet, sprinkle melty cheese, fold it, flip it, and allí está…a sandwich worth eating. Slice it like a pizza and you can dip it into hot sauce too. Heat the skillet and the oil to medium. Lay a tortilla on it. Cover half with filling (Not too thick! Maybe 1/4 inch – you don’t want a mess). Sprinkle cheese (especially around the edge to make a seal). Fold the empty tortilla half over. Allow to cook a minute, then flip with fingers if you are daring, or a spatula. Turn a few times until a bit crispy and transfer to a plate. Start again with another tortilla. You can slice into wedges and serve with whatever condiments go with your filling. 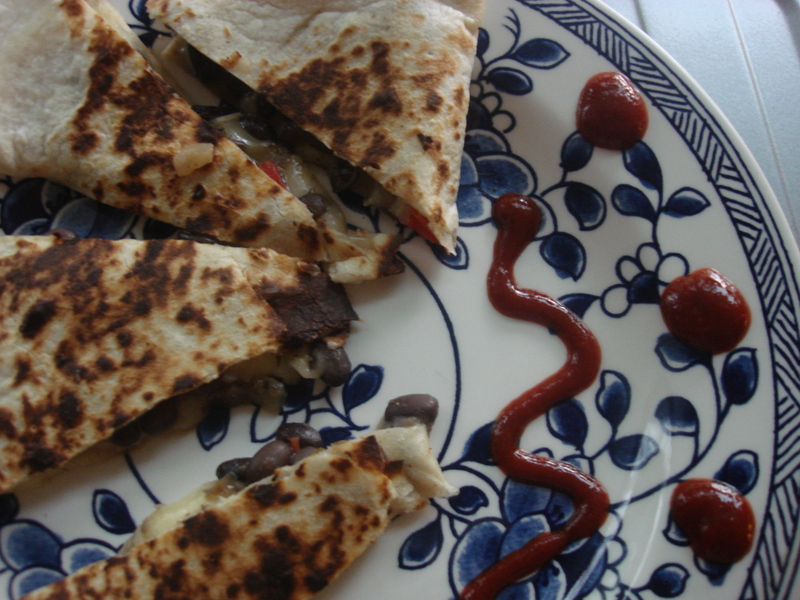 I love sandwiches, but it’s hard to compete with a quesadilla!